I did once ask if Reckless Barrage and Resilience are supposed to interact, and the answer was yes. However, reading the powers again I'm not sure what that interaction is supposed to be. Reckless Barrage says you place a wound marker "to" attack again, implying that if the wound is prevented the extra attacks are not allowed since the condition has not been met. Then it's a question of whether or not you can attempt Reckless Barrage again in the same turn. I doubt this is how the interaction is intended to work, but I would like clarification. I'm ok with voting for it as-is as this is something Editing can work out wording-wise, but I'd like to be clear on the intent. Yes, the intent is for the wound to be placed, unless the die roll excludes that happening. You can get the extra attacks regardless of whether or not you actually take a wound. As for the flying symbol, I would probably vote too. However, I would consider a four power card, if all four powers were necessary for theme and gameplay. Thrangir by superfrog has received 4 Yeas votes for review (capsocrates, vegietarian18, nyys, and Scytale) and moves onto unified fanscape evaluation. and 3 at silversand30 on ebay. I did a few playtests with him in Legionnaire, Marro, and Ornak armies and he seems to be balanced, as he will fall quickly to repeated attacks. He will probably cause some havoc though before he goes down. Theme- Kar-Nu-Sa is dripping with theme. A marro genetically based on some feral creature that relies on pheromones and sheer adrenaline to help it survive, and boosting other similar creatures. Creativity- Kar-Nu-Sa has plenty of creativity, pheromones are based on real animals that rely on pheromones to send messages to others. Adrenaline leap is cool as it represents "fight or flight" in my opinion. Balance- With bonding he has some good stats, except for defense but that is helped by his pheromones. 6 life will mean he'll stay for a while, and his killer move number will let him keep up with the Groks. However, he will die to range as his pheromones only work against melee. Also if he gets locked into melee figures who can withstand his attacks, it won't bode well for him either. 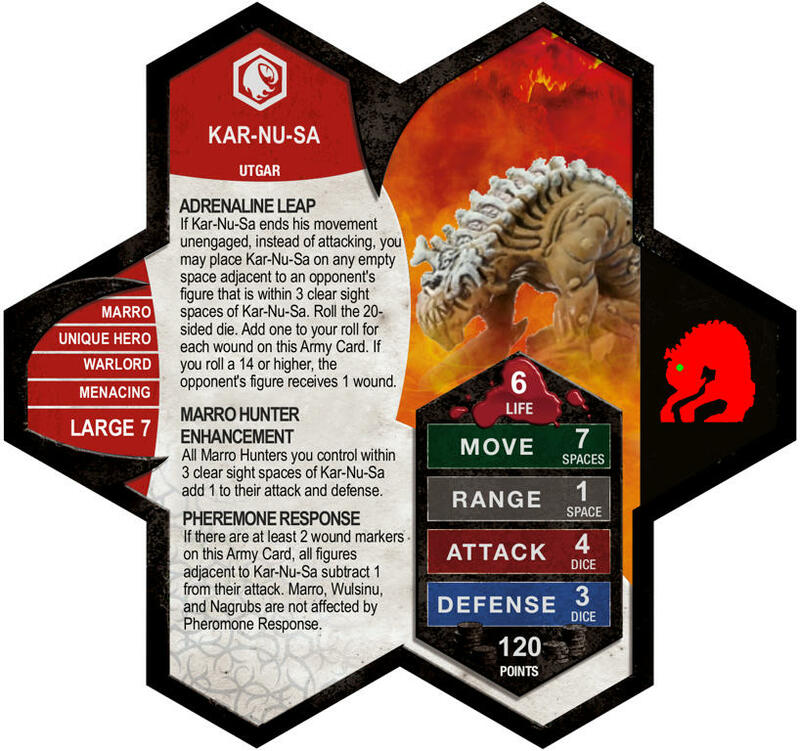 Playability- Kar-Nu-Sa does good as a first wave with the Groks causing havoc and then once the Groks have started to die, slinking back and boosting the Drudge to shoot down the remaining enemies. Summary-Overall a very fun and cool unit that will hopefully boost up two underused units, (Groks and Drudge) up in playability. I would very much like to say to this unit. Unfortunately, whatever dolt decided to make the card spelled Pheromone wrong. So until that's fixed, . P.S. I made the card. I just had a thought on availability issues with Kar-Nu-Sa's submition. What if when looking for viable miniatures, we did a poll to see how many people actually had the figure. That would lower the needed availability numbers and increase the number of potential figures. For example, I already have Kar-Nu-Sa's figure and I imagine several other 'scapers do as well. Scytale for example has used this exact same figure in his demon customs. I would imagine a good number have this figure due to Scytale's customs. 86 is a good number so it is not a big deal with this submition, but just thinking about other figures. Not a bad thought. We do take into consideration how many 'Scapers already have. If there's iffy availability, but you have a few and someone you know has a few, post it here, that's always good to know. Oy! Does he have to be a Warlord? If he's going to bond with the Grok Riders, then yes. To bond with the Grok Riders he does. You're worried about Romans making this guy underpriced, right? Hmmm. Well, he works better with Marro, at least synergistically. That's enough for me to give it an to testing (whenever I get around to fixing the card).